Erin and I have been celebrating the season over the past few weeks starting with pumpkin carving at our friend's (Pete and Leah) house. 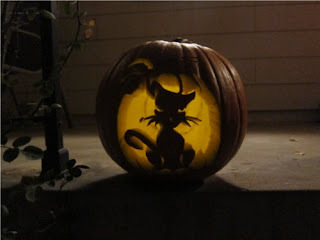 We tend to put a fair amount of effort into our pumpkin carving and this year was no exception as we carved out a cat. It was also fun to just hang out with friends and enjoy some snacks. For Halloween night itself we didn't actually do the traditional dressing up or handing out candy. Instead we went to a restaurant called "Jing" which serves Asian Fusion cuisine. The food was okay, but for the price it could have been better. After dinner we were near a theater showing a movie Erin and I had wanted to see called, "7 Psychopaths". From the ads it looked like it would be a comical dog-napping story. Unfortunately for Erin it proved to be more about psychopaths and less about the cute dog. I (and the rest of the men in the audience apparently) enjoyed the humor, but it was a bit too gruesome for Erin. Last night we finished off the spooky diversions by going out to see a reading of Edgar Allan Poe's works. We started the night at Cuba Cuba for dinner and drinks with our friends Cameron and Rachel. The food was good and the mojitos were tasty. We then walked to the reading at the Byers-Evans house near the Denver Art Museum. There was an ensemble of 6 or 7 actors reading poems and plays from Edgar Allan Poe. Some were better than others. Sometimes the actors helped place us in the scene. Other times they detracted from the scene or made them hard to understand. All in all though we had a good time and an interesting evening.